Do you need to brush up on your driving? Refresher lessons are ideal for those that haven't been driving for a while or feel stressed when driving in certain conditions. Many people find that problems develop when they haven't driven regularly or have been involved in an accident and lost their confidence in their driving. These lessons will help you address these issues and slowly build up your driving skill and confidence on the road again. Its also useful for international drivers who need to get used to the UK driving on the left. You choose what area you would like the lesson to be on, whether it's got to do with town driving, parking or just building up confidence on driving in the countryside. You might even prefer to take the extra lesson in your own car to get used to how it drives. 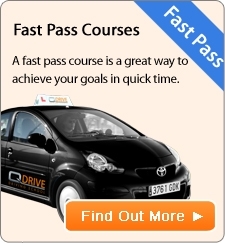 Your driving instructor will design a plan with you on how to get the best out of the lesson on what you want to achieve. Contact QDrive to discuss further. You can choose to do an hour lesson from £28 or block book lessons at a reduced cost.